I’m starting a new series of blogs titled “Forwards from Grandma”. I’m only going to post the ones that are true. About half don’t pass the Snopes.com test. This one does however. I will research them before I post them here. 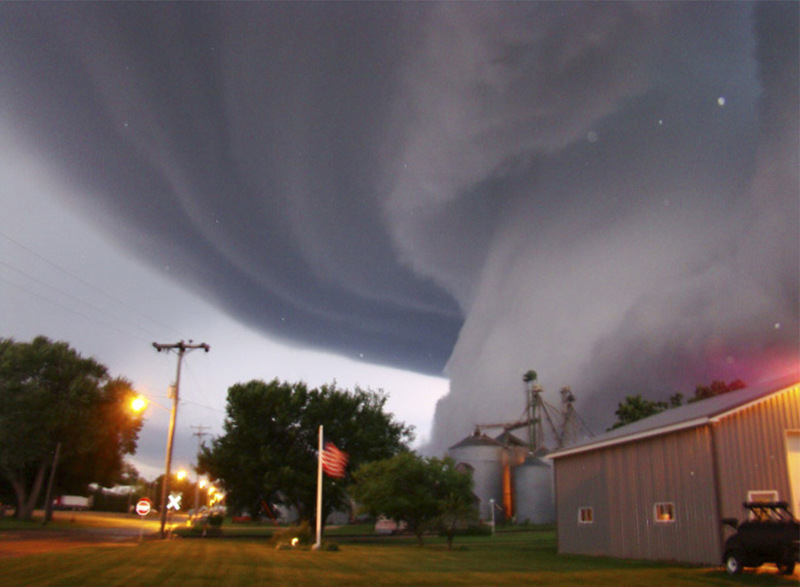 A huge tornado funnel cloud touches down in Orchard, Iowa, Tuesday, June 10, 2008 at 9:04 p.m. The Globe Gazette and Mitchell County Press News reported that Lori Mehmen of Orchard, took the photo from outside her front door. Mehmen said the funnel cloud came near the ground and then went back up into the clouds. Besides tree and crop damage, no human injuries were reported. 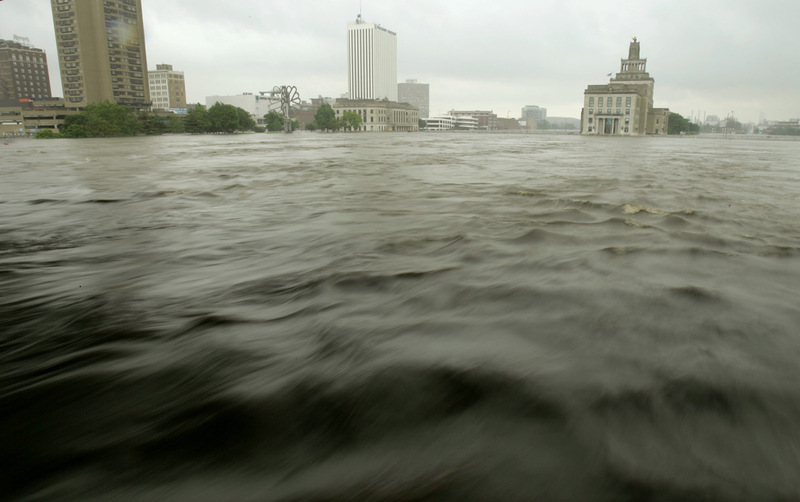 Water from the swollen Cedar River rushes past downtown buildings Thursday, June 12, 2008, in Cedar Rapids, Iowa. 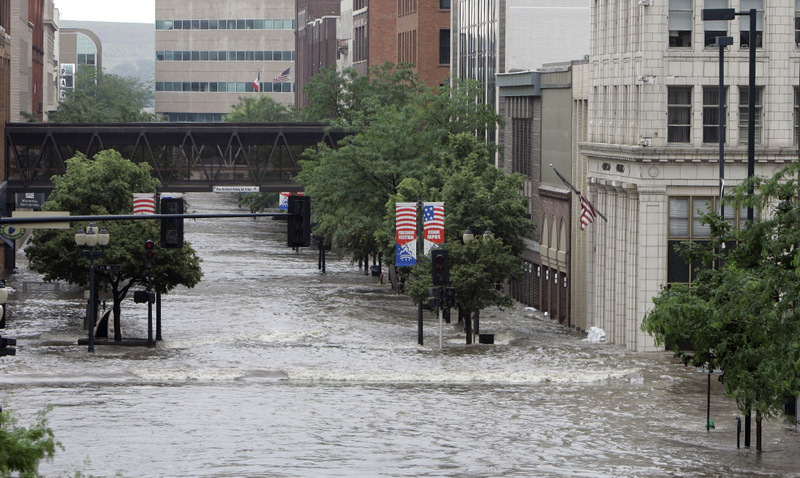 Officials estimated that 100 blocks in Cedar Rapids were under water forcing the evacuation of nearly 4,000 homes and leaving cars underwater on downtown streets. 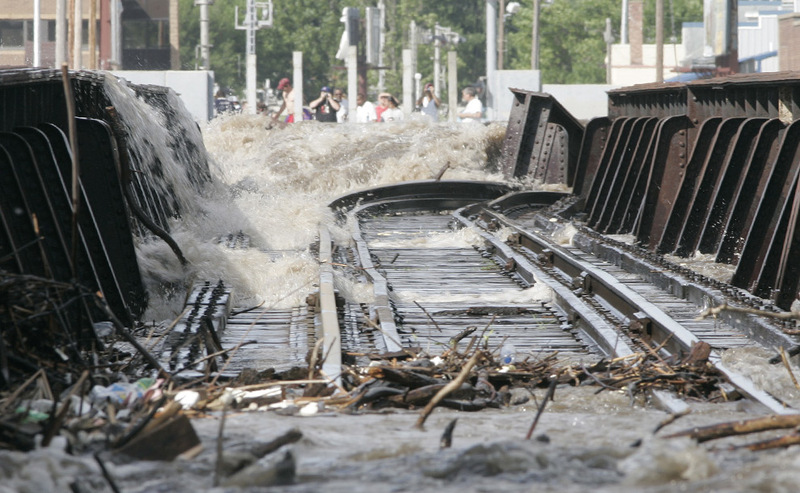 A Union Pacific bridge is partially swept away by high flood waters on the Cedar River in downtown Waterloo,Iowa on Tuesday June 10, 2008. Flood water from the Iowa River rages through farmland June 15, 2008 near Oakville, Iowa. 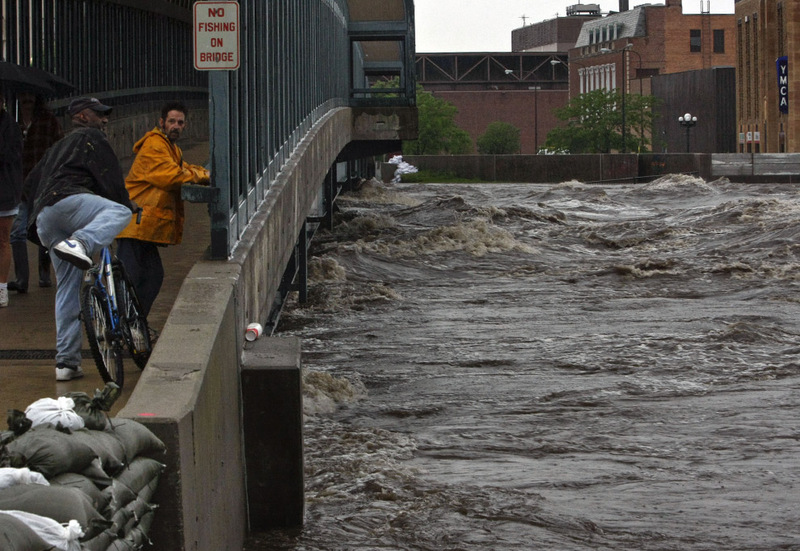 A flooded street Thursday, June 12, 2008, in downtown Cedar Rapids, Iowa. 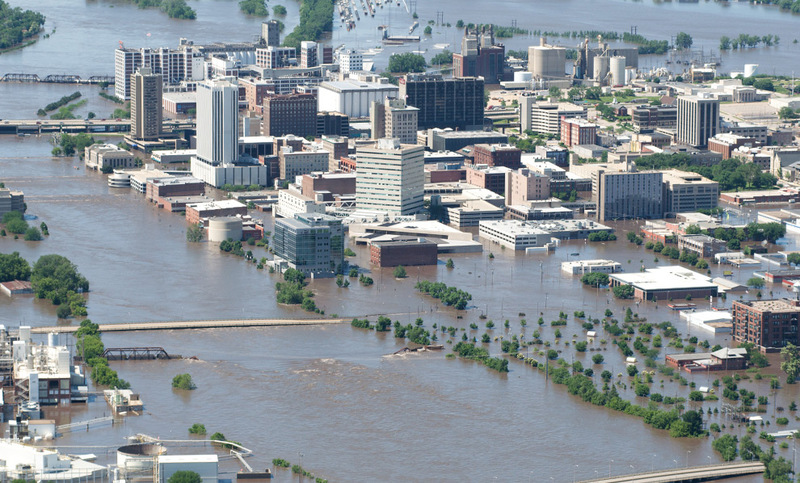 An aerial image of downtown shows flood-affected areas June 13, 2008 in Cedar Rapids, Iowa. 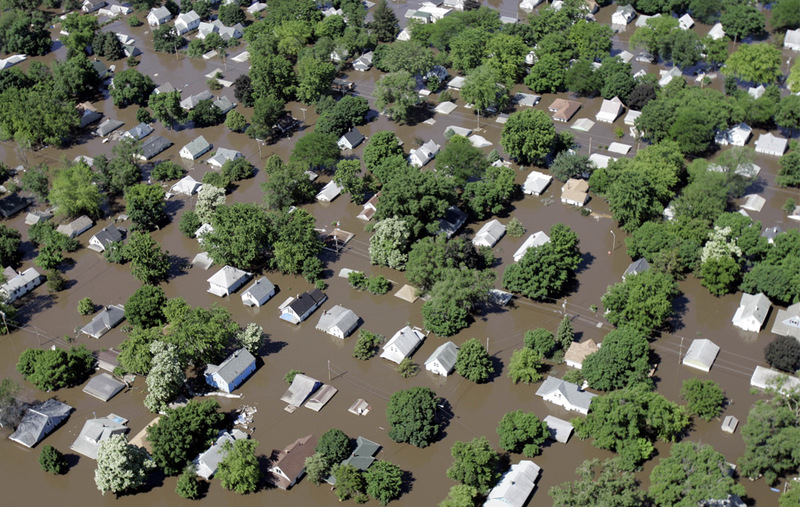 Flooded home are seen Saturday, June 14, 2008, in Cedar Rapids, Iowa. 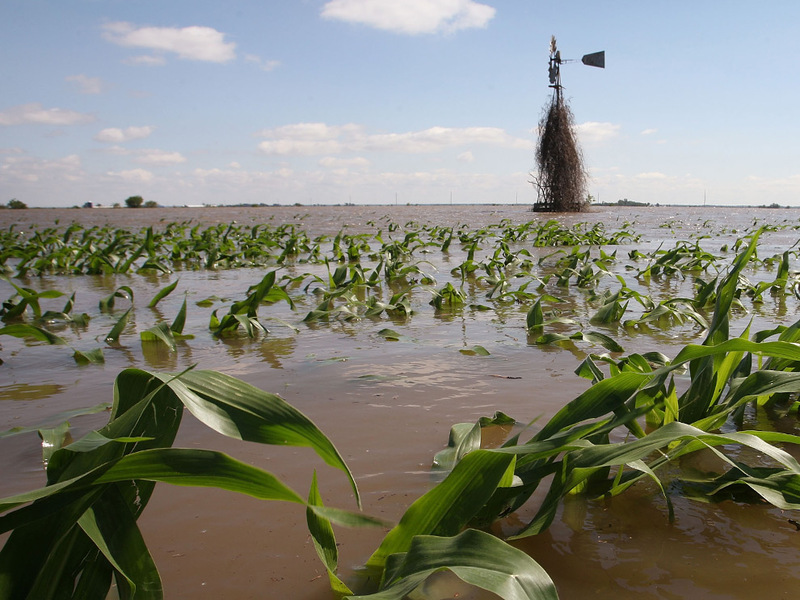 A corn field is submerged in flood water June 16, 2008 near Oakville, Iowa. 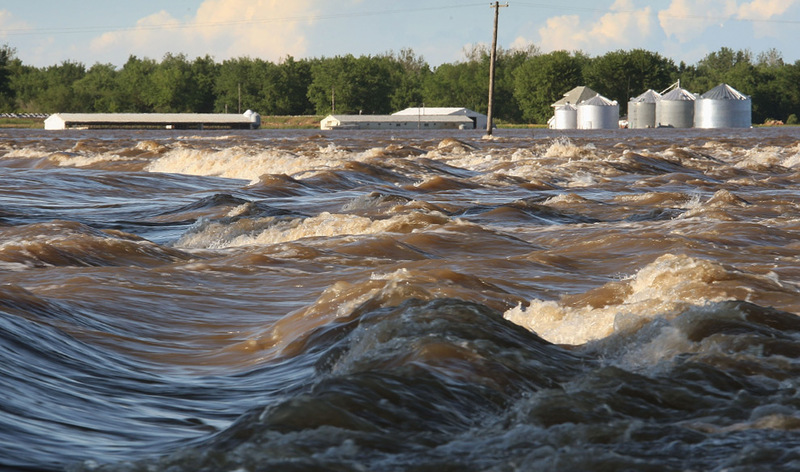 Farmers along the Mississippi River in Iowa have been emptying their grain bins and evacuating their livestock as they prepare for record flooding. 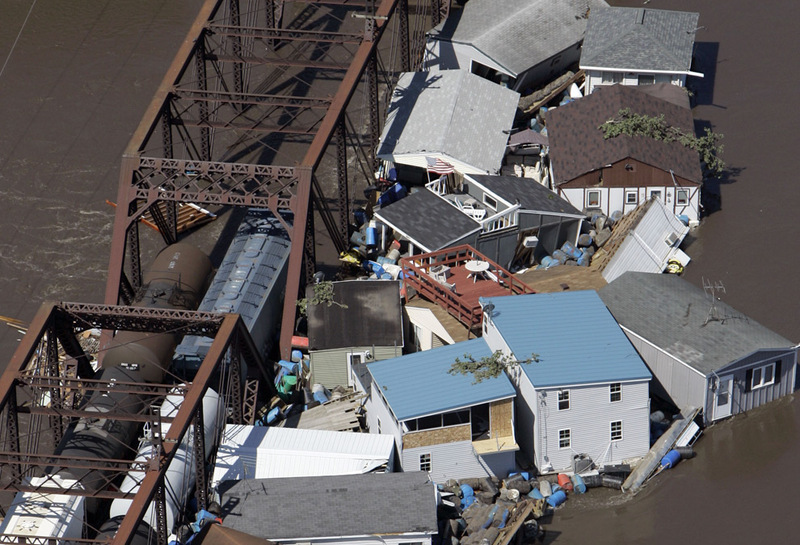 Buildings and debris are seen floating in the Cedar River against a railroad bridge Saturday, June 14, 2008, in Cedar Rapids,Iowa. 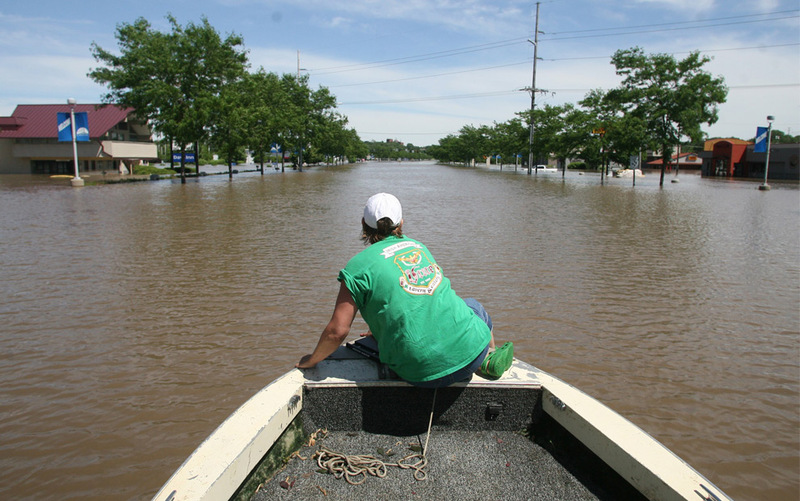 Kitty Lake, owner of The Vine Restaurant, rides on the front of a boat while surveying the floodwaters on Highway 6, Friday, June 13, 2008 in Coralville, Iowa. 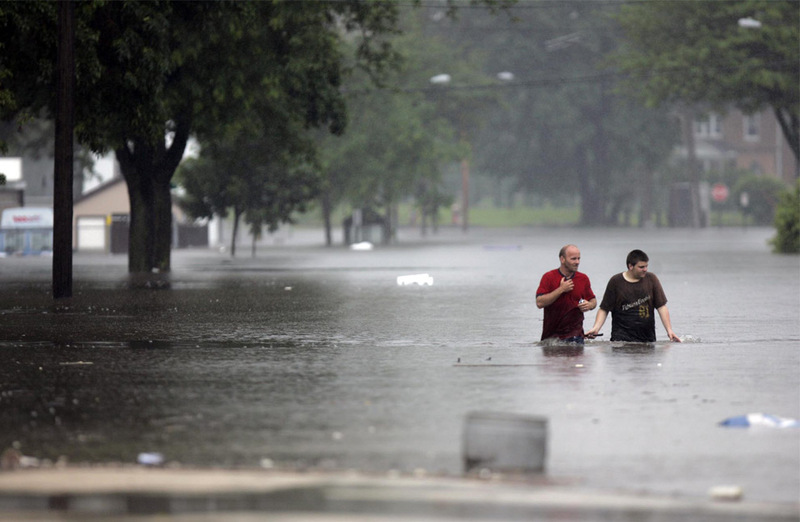 William Kimpton, left, and Ben Walker, both of Cedar Rapids,Iowa, wade through floodwaters in Cedar Rapids, Iowa on Thursday afternoon, June 12, 2008. 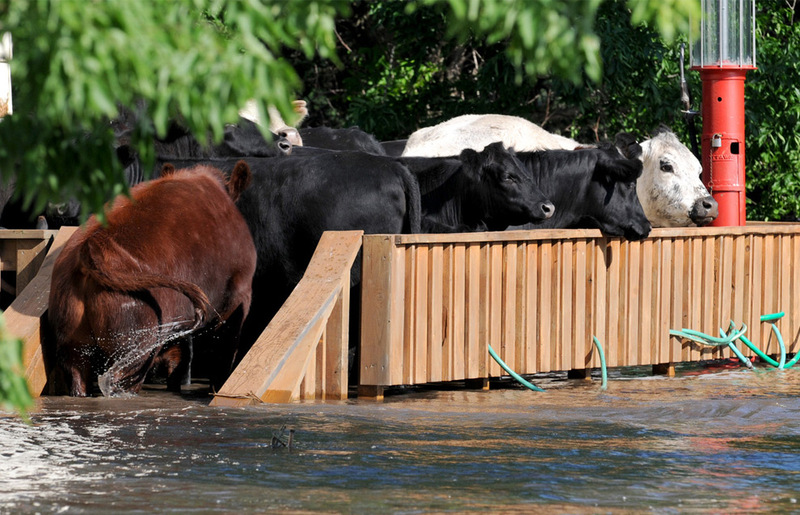 Cattle were herded onto a porch and left to avoid drowning by the rising water from the Cedar River Wednesday June 11, 2008 along the river north of Vinton, Iowa. 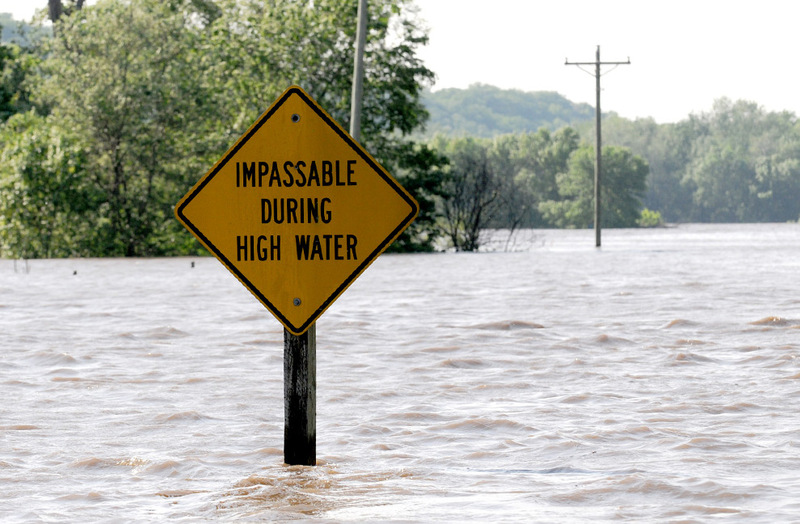 A sign is completely submerged along a road north of Vinton, Iowa, as water from the Cedar River continues to rise Wednesday June 11, 2008. 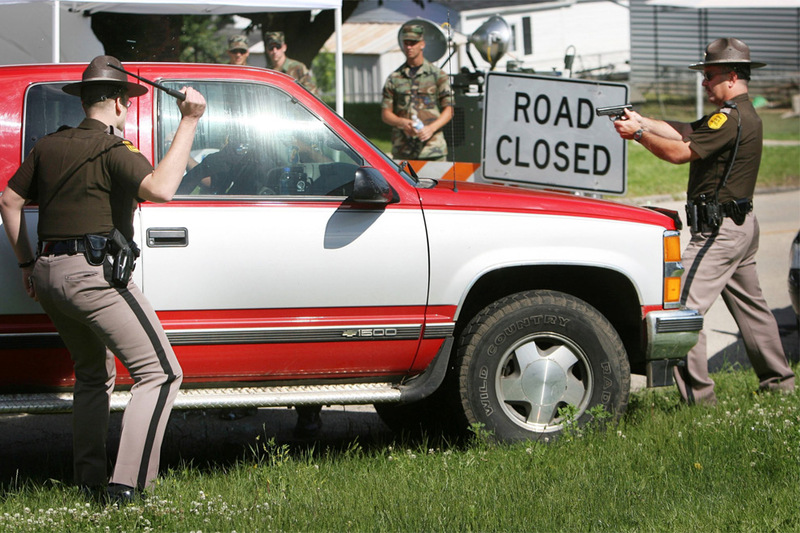 An angry resident that tried to drive around a security checkpoint is stopped by one police officer, right, while another tries to break his window to extract him in Cedar Rapids, Iowa, Monday, June 16, 2008. 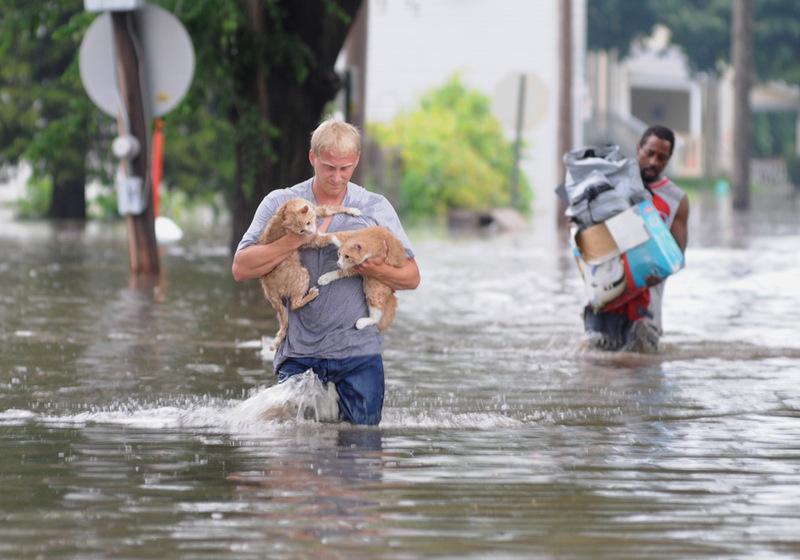 Brandon Smith carries his two cats, Fry and Bender, to dry land from their flooded and evacuated home on June 12, 2008 in Cedar Rapids, Iowa. Mac & Cheese, originally uploaded by ahhyeah. Grandma had some leftover mac & cheese.